Share the post "Breeding Hazelnuts for Emerging Markets"
Tom Molnar continues groundbreaking research of the late C. Reed Funk. Rutgers hazelnut selection with shell cut away to show its large, high-quality, round kernel–a major breeding objective of the program. Apart from the blueberry and cranberry, many of New Jersey’s major crops are not native to the state. Perennial favorites like peaches, tomatoes, corn, eggplant, and peppers have actually been adapted and bred for suitability to our climate and growing conditions. New Jersey’s commercial food crops are mostly fruits and vegetables, but it is potentially a nut-producing state, as in hazelnut, a native nut that is currently being researched for potential commercial production. In New Jersey, native hazelnuts grow as a spreading shrub, but it is the European variety, which is taller and grows as a single trunk tree, that is grown commercially. The U.S. contributes only a small part of the worldwide hazelnut (a.k.a. filbert) production, with Oregon being the leading national producer. The European variety of hazelnut is favored because it produces large nuts with thin shells and high quality kernels, whereas the North American hazelnut produces tiny, thick shelled nuts. Hazelnuts are widely adapted, and depending on the cultivar, can be very cold hardy. In regions such as New Jersey, the Mid-Atlantic and much of the fruit belt of the eastern U.S. and southern Canada, many hazelnuts would thrive. 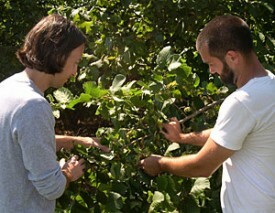 Tom Molnar and field researcher John Capik examine nut clusters on breeding trial trees. The conundrum, as is often the case with imported species of plants, is that they are not resistant to disease, the way native species are. 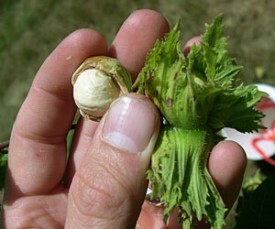 Such is the case with the European hazelnut, which is susceptible to Eastern Filbert Blight, while the North American hazelnuts are resistant. Also lacking in cold tolerance, the suitability as a commercial crop in New Jersey doesn’t currently make the European hazelnut a good candidate. However, Thomas Molnar, a plant breeder at Rutgers New Jersey Agricultural Experiment Station sees the potential of hazelnut as a suitable crop to New Jersey. 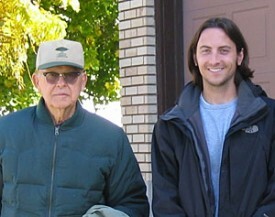 Molnar and his mentor professor the late C. Reed Funk, whose vision led to the development of the hazelnut breeding program. Funk passed away in 2012. “We are confident by the end of this decade, due to our breeding and research (and in collaboration with Oregon State University, the University of Nebraska, and the Arbor Day foundation), there will be small to medium scale orchards of hazelnuts being grown for nut production in New Jersey and surrounding states,” he added. The cultivars being developed will also appeal to home gardeners. In addition to hazelnuts for nut production, Rutgers is also developing a new line of disease resistant ornamental hazelnuts. These include plants with attractive purple leaves and bright fall color, as well as those with contorted and weeping branches. The fall color comes from the native hazelnut and the purple leaves from the European species. These plants also produce nuts, making them edible landscape plants. Molnar’s research was born out of the vision of the late C. Reed Funk, renowned for his turfgrass breeding program at Rutgers. Recognizing the need for hearty crops to meet world food demands, especially for use on marginal agricultural lands, Funk saw nuts as a sustainable crop for food, feed and oil. New Jersey’s hazelnut breeding program is yet another Rutgers program demonstrating Jersey Roots, Global Reach. Learn more about Hazelnut Research and Breeding at Rutgers.